Way too tired to go deep or long today, but there is much I need to share with you soon. But first let's do the numbers. Since starting this blog about a month before my transplant on July 1, 2008, I was had about 108,000 visits, or about a 175 a day, It's not my friend Chaya's wonderful resource for anyone with CLL, CLLtopics, but it is telling a story that some of you want to read. It is a blessing for me to be able to help in any small way. Even in the new decade with my sparse updates and the rare dramas, well over a 1000 of you drop in every week. From every continent except Antarctica. 800,000 visitors to Machu Picchu every year. Over 2000 tourists stranded by the heaviest rains in 15 years wiping out the only way, PeruRail. My son, Ben and his friend Yasmin are safe in Cusco, but their dream of seeing the sun rise over MP is on hold for now. Earliest estimate of repairs are 2 weeks. As a dad, I just happy they are safe. So it looks like I need the IVIG but a 13 day visit to Israel is within my safety limits with infusions 15 days apart framing the miracle journey. Good that I can be focussing on what's outside my blood stream. It is more than good to be counting the thrills and joys and human contacts, and not just the complete blood count. Good news. Very good news. At UCSD today and my platelets were a salubrious 256,000 and my palpable nodes are essentially unchanged in 3 months, according to the learned fingers of Dr. Kipps. Rest of the blood work was that wonderful phrase: within normal limits. Maybe time if not to throw the engine in reverse as I race to a second transplant, to at least make a pit stop and carefully plan my next move. Tomorrow I see Dr. Kipps, my main CLL guru, and I haven't given it a moment's thought. I am too busy enjoying the non-remitting but definitely wonderful respite that IVIG is giving me from platelet worries. It is more crucial and fun to plan the details of our 2 week trip to Israel and Cairo, framed by IVIG drips. It was more important to have visited my daughter and son-in-law in the rainy bay area with our adopted grandma, enjoying the view of the Golden Gate Bridge or the Amish quilts at the DeYoung, and for the non vegans, clam chowder in a sourdough bowl at Fisherman's wharf, and of course, chocolate at Ghirardelli Square. I must give proper time to worrying about my son, Ben, now in the Amazon jungles on his way to help the poor people of Pisco, Peru rebuild after their devastating earthquake. Plus I feeling the building excitement of my youngest son, Will's next art opening this Saturday. 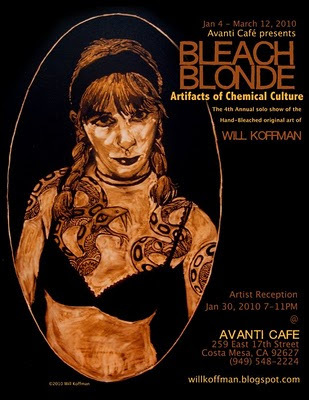 It's my fourth annual show at Avanti Cafe, a collection of new work entitled Bleach Blonde. art, food, wine, and live music from Black Elephant. I guarantee a splendid time with amazing bleach art, a great mix of people of all ages, fun live music, and delicious and good for you veggie hors d'oeurves. I will be there for sure. My CLL has kept me away from past such events, and so I plan to enjoy every second of this one. Hope you join us. The torrents of rain today made me question any action that meant leaving the house today. Never forgot to be thankful for a dry place to sleep. And then it was gone. Ignoring all warnings we drove to the beach where waves were sending their spray over the top of the Newport Pier. That's a big wave. 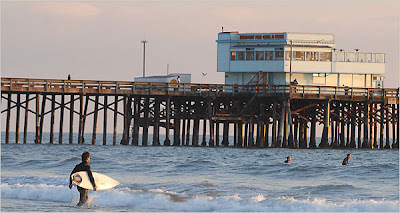 A chaotic churning of at least three storm systems had waves thrashing at the pilings from several directions, never pausing to rest, but collapsing on themselves or building in unpredictable peaks of froth. And a walk to the wedge where there was a new and sudden 6 foot drop off from the flat sand to the tumultuous waters below, taking concave bites out of the beach, threatening the solidity of my path . Where the solid land begins is always the questions, especially at the shoreline. It seems too easy to use the calm between storms to paint a metaphor for my pregnant pauses by which I choose to ignore my CLL and ITP for the 2 weeks between each and every treatment of IVIG. Both my path on shifted sands and my future are most uncertain. And I must get close to the edge to move on.. I will go no further into that mist. I spent a few hours with a visiting young CLLer trying to help him clarify his tough decisions. I reviewed a few articles. That feels good. Helping another, feeding my head. Thinking about it, making decisions is a whole other matter. Best ignored. CLL will be oppressive enough, soon enough. I will not invite it into my consciousness. I have been busy trying to plan a trip to Israel on a limited budget and a tight schedule framed by life sustaining IVIG infusions. It has kept me glued to a small laptop, my generation's answer to the idiot box as the great time waster. Our trip will be pretty standard fare, but I must visit Safed where I can walk in the footstep of Isaac Luria, and if I am lucky and don't try too hard, maybe just maybe I will see a vision of a healed world. First I got to find a way to get to the middle east and travel while I'm there, keep a clean roof over our head, eat my veggies and still get home while my platelets are still copious and my credit card isn't feeling tipsy from the heights it's climbed. I feel a bit like Cinderella. Last night, I broke from the ionic grip of the CPU to picked up my Canadian cousin at LAX during his 7 hour lay over to take him for a vegan meal and catch the sights of Santa Monica, home of the homeless. It was a eye and mouthful for him. "I didn't know vegetables could taste this good." We ate at Real Food Daily, not raw, but at least vegan and organic. I figured that was enough of a culinary stretch. We then walked the nearby third street promenade. I ask you: Where else can you see skateboarding dogs and hear electric violins? Being an only child, it was a unique kind of joy to share a meal and some conversation with my cousin. 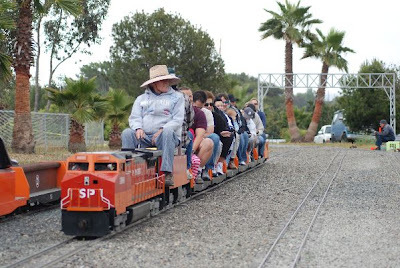 Today, my wife and I went for a brain re-orienting miniature train ride in Goat Hill Junction, Costa Mesa, and still had time to catch another amazing, only in California, sunset. It is good to be a kid again, if only for a few hours. Patty and I are tentatively planning a trip to Israel and a very quick visit to the pyramids of Giza on our way home. We are planning to spend one full day in Cairo, getting out before I find the germs or they find me. No cruises down the Nile. In this case denial is a river in Egypt. No visits to the Temple of Karnac in Luxor. With my lower immunity, I want to be just one flight and one day away from a clean European hospital and safe food to eat and water to drink. What took Moses 40 years, will take us 75 minutes by El Al Airlines. In reverse. Most of the trip will be in Israel, visiting my donor and seeing the sights. It will be our first visit and we are pretty excited. Not hooking up with a big tour, but doing it our own. My platelet count yesterday was an amazing 290,000 a full 16 days after my last IVIG. That's the best it's been since August. No clear answer on why the scary drop to 29,000 six weeks ago, but I am enjoying the reprieve. We will be on the road for 14 days. Right now, I planning to get my IVIG the day before I leave, and the day I get back 15 days later. Hey, we went to Japan under almost identical circumstances and that was in my sushi eating days. When I return, the push for the cure. How old do you think Moses was when he saw the burning bush? 80 years old. And although he was to live to 120, he was still well past the prime of his life. I was reminded today of that fact when reading the Torah at services. I have seen no burning bushes, heard no voices, never stood up to corrupt power mano a mano, been no agent of liberation for a whole nation, climbed no mountains, received no revelations, put down no rebellions, lead no people for 40 years through a moral, psychological, and physical transition from slavery to freedom, and I have never glanced into the promise land. Moses did all this, and he started as octogenarian, dying some 40 years later at the edge of the promised land. When I am overwhelmed by fatigue and a sense of the trying struggles ahead, it is important to pick the right mythical hero. A flawed, quick tempered, "tongue tied" hero, separated from his people and religion most of his life, Moses is not for me an object of admiration of worship but a flesh and blood example of how to behave when you get the call to action. How to use what gifts you have, despite your age and limits. Hey, I am only 58 and some say I have the gift of the gab, both advantages over my teacher. My struggles are trivial. Limited. Not historical or mythical. I have no grand delusions. I just want a cure, and by that cure, and the story of its twists and turns, I hope to shine a small light on on way out of the maze of sickness and despair for others lost in the dark. 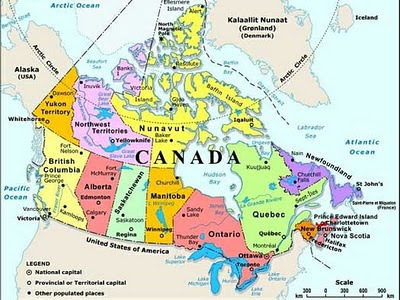 I sorely miss Canada and am fiercely proud of the country of my birth, but I can not return to Ontario, the province were I grew up until I am convincingly cured. I just can't take the chance with my health. If I had stayed in Toronto, I might be dead. The drug, rituximab, that is mentioned in this must read linked Globe and Mail (Canada's premier English newspaper) article is the very one that has saved my life (and that of thousands of others) and has given me a chance to fight on for a cure. Without it, my odds were very grim. It's not available for CLL in Ontario, Canada's most populous province. Elizabeth Locatelli who is quoted in the article helped put together the wonderful CLL conference in Niagara Falls I attended and spoke at earlier this year. But here in the golden state, I am doing well, and am looking forward to getting rid of my leukemia once and for all with the help of the expensive rituximab added to some cheaper chemo (FCR) and a second transplant later this year. As the USA moves towards the enormous benefits of universal health care, I need to scream out about the terrible risks. Worse yet, I also understand that a transplant is completely out of the question if you are over 55, so my Canadian goose would really be cooked, which is really sad when you are vegan. 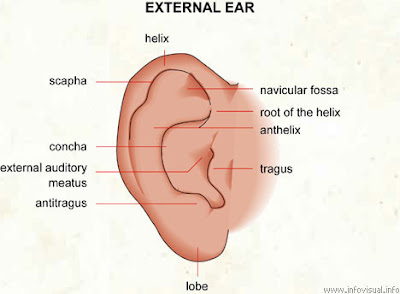 I have something tender and red growing on my right outer ear, some kind of cyst or small furuncle (boil) and I may have another at the nape of my neck. They are both where I can't see them. Does that tell me something? I can't make my own diagnosis and prescribe my own treatment. Is there a lesson I need to hear? I saw my family doctor and long time friend who started me on a gut churning antibiotic. Probiotic to the rescue, I hope. Still you can't be too safe with a wimpy immune system like mine, especially with an infection near the delicate cartilage of the helix of the auricle. Better to over than under treat. Reminds me of my vulnerability, the fragility of my health. Oh, well, I am not going to worry. This is a fixable problem. A minor woe. Besides, I have bigger bok choy to chop. The best part about being away on this car trip to the San Francisco bay is that I get to leave the CLL behind at home. A vacation may not be a chance to lock the clone in a dark closet and escape its evil reach, but it is the possibility to shrink its power by making my world a bigger playground. Doing this necessarily makes the cancer a smaller piece of that world. It was also a chance to rejoice in surviving 2009 and jumping headlong into a new year. More chances to have more fun and more love and do more good works. See more, live more. A Da Vinci designed camera obscura, as big as a house on a cliff overlooking the Pacific Ocean where you could almost taste the waves on the wooden disc inches in front of you, Amish quilts at the De Young Museum that make you think that some of the birth of the cool hard edge artists stole from those independent people and Balmy Alley murals that make you want to cry and shake your head. Happy new year. Yes It will be a happy new year as we all move forward with gusto and compassion.